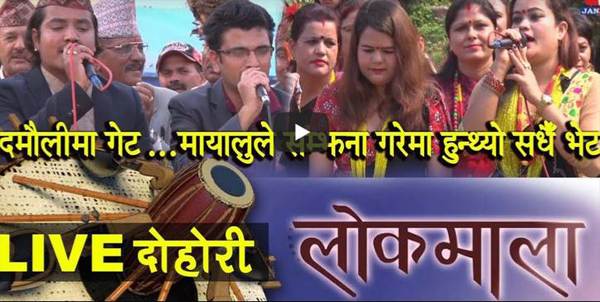 New Nepali Comedy Serial Golmaal is a rural comedy serial is popular TV serials in Nepal. It is broadcast-ed on Nepal Television every Friday at 7:00 PM and on our YouTube Channel at 7:30 PM. Production Adviser: Parshuram Rijal Production: Vibes Creation Pvt. Ltd. Writer/ Director: Raju Paudel (Raju Master) Banner: Vibes Creation Pvt. Ltd. Legal Adviser: Krishna Prasad Acharya Editor: Rabindra Khadka Camera: Sagar Khadka Sound: Dinesh Tamang Light: Prakash KC Makeup: Yadav Thapa Music: Krishna Raj Bhandari Singer: Chetan Sapkota/ Narayan Dhital/ Parshuram Rijal Artists: Jayananda Lama, Ramesh Adhikari, Shambhu Thapa, Keshav Sapkota, Nabina Shrestha, Shanti Basnet, Yadav Thapa, Samar Gautam, Krishna Mangal Shrestha and More.